II MARATHON SALSERA IN CALAFELL !! SALSEROS SI LLAMAN...ESTO NO HAY QUE PERDERSELOOOOOO!!! !JA JA JA!!!! EL PROXIMO SABADO DIA 25 DE JULIO TENEMOS LA II MARATON SALSERA EN CALAFELL, EN LA PLAÇA DEL ESTANY!!! UNA TARDE NOCHE PARA DISFRUTAR Y BAILAR SIN PARAR!!!! RECORDAD, QUE SI PODEIS, VENIR VESTIDOS DE BLANCO CON SOMBRERO INDIANO!!!! 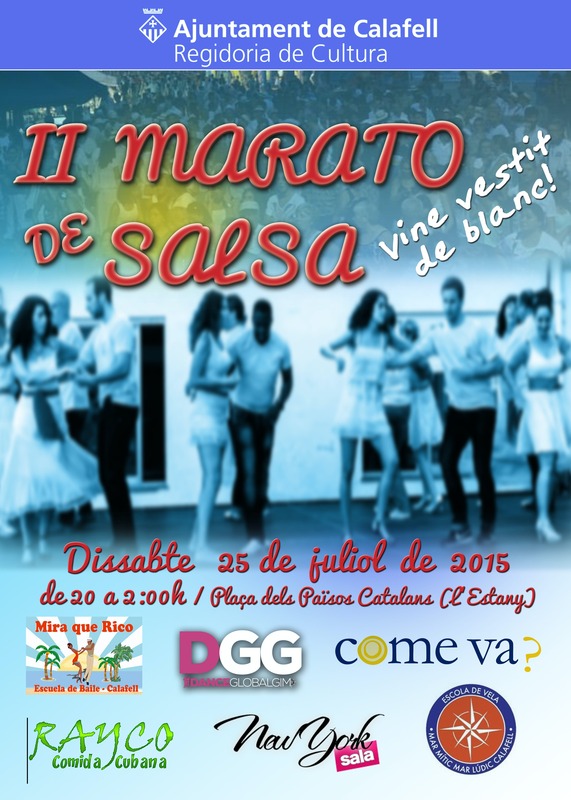 VAMOS A VESTIR CALAFELL DE BLANCO Y A SALSEAAAARRR!!!!!! IREMOS ANUNCIANDO TODAS LAS ACTUACIONES QUE HABRAN DURANTE ESTOS DIAS!!!! OS ESPERAMOS!!! NO OS LO PERDAIS!!!!!! MIRA QUE RICOOOO!!!! !